On September 7, I attended the fourth annual Fry Fest in Coralville. This yearly “celebration of all that is Hawkeye” turned out to be another memorable event. The day started with an appearance on the Steve Hexom Morning Show just after 9 AM. 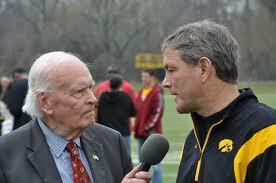 I had a blast, talking with Steve about my latest book and this year’s Hawkeye team. At 10 AM, the doors opened at the Marriott Hotel and Conference Center, and Fry Fest 2012 got under way. My first stop was at the Hawkeye Collector’s Showcase. The Collector’s Showcase was a new event this year where fans had an opportunity to show off their rare Hawkeye collectibles. Several interesting and unusual pieces of Iowa memorabilia caught my eye, but there are two I specifically remember. One was a Hawkeye jacket worn by Iowa coach Bob Commings during the Iowa-Ames game in 1977. Commings’ son-in-law brought the jacket to the Showcase, and I enjoyed talking to him for a bit. Second, a huge table was filled with almost every Hawkeye pin you could imagine. It displayed every Hawkeye homecoming pin since 1924 and several other unusual Iowa pins as well. The pin collection belonged to Bob Hibbs, who has written several books about the town of Iowa City. It was nice to run into a fellow Iowa author, and his collection was certainly impressive. All in all, the Fry Fest Hawkeye Collector’s Showcase was a great success! I hope they hold one at Fry Fest next year, because I would definitely check it out again. This is my favorite part of Fry Fest every year. Thousands of Hawkeye fans swarm into the Conference Center where vendors are selling literally anything you can think of in black and gold. Clothing, food, collectibles, household items…if it has a Tigerhawk on it, it’s probably at Fry Fest. Naturally, there’s a ton of local media covering the event. From television to radio to newspapers to internet fan forums, it seems like every media outlet in the state stops by Fry Fest. I had just walked into the convention center around 1 PM to take a look around. Within a minute, I come upon a booth for radio station KMRY, and standing right in front of the table is the legendary Bob Brooks. Brooks is one-third of the Brooks-Zabel-Gonder trio that endeared itself to Hawkeye fans from coast to coast over the radio airwaves before 1997. He’s seen it all, done it all, and reported on it all. And here he is, just hanging out at a table at Fry Fest, waiting for someone to say hello. Not one to miss an opportunity, that’s exactly what I did! I gave him a copy of my book on Duke Slater, and he pointed to the cameras behind his table and asked if I’d like to do a segment with him for his show, Brooks on Sports. I couldn’t say yes fast enough! We filmed a bit for his show, which airs on Mediacom Channel 22. I’m sure I did a lousy job…I didn’t know if I was supposed to look at him or the camera! But either way, it was an amazing experience I’ll never forget, just spending a few minutes behind a microphone held by Bob Brooks and answering his questions. As an Iowa fanatic, it simply doesn’t get any cooler than that. There were also autograph sessions by Iowa players and a roundtable discussion featuring several Hawkeye athletes. John Harty, Rob Houghtlin, Matt Hughes, Rob Thein, Warren Holloway, Derek Pagel, Mike Humpal, Andy Brodell, and others signed autographs for the fans. At one point, I was walking past a random table, and there was Hawkeye great Larry Station selling his self-published book aimed at parents of aspiring student-athletes. I had bought his book already when it first came out, but I still stopped at the table, shook his hand, and interacted for a minute with one of the greatest linebackers to ever play college football. And that’s what makes Fry Fest one of the best events on the Hawkeye calendar every year.